This lovely home has been totally refurbished and has comfortable and modern furnishings and fittings. The 3 bedrooms are all warm, and bright, with the master having an ensuite. Open plan lounge, kitchen and dining allows plenty of space to spread out. Sliding doors have made for uninterrupted views of the city and the harbour, and give access to a large deck. Double glazing ensures the all day sun keeps the warmth in, although a gas fire provides lovely ambience to relax by, or for cooler evenings. Directly across the road is a small playground, and a short 10 minute walk downhill takes you to the Bayfield inlet where there is a larger playground, a perfect spot for a picnic. The location is very central, being a short 5 minute drive to the beautiful St Clair beach, renowned for surfing and swimming. St Clair has 5 fabulous restaurants catering for all tastes. St Clair also boasts the unique Hot Salt Water Pool, perfect on colder days or for wee ones, or the elderly. For the really keen it opens at 6am for those who like to start their day with a refreshing swim in a totally unique setting. We are very close to the City, and the Stadium, just a 7-10 minute drive, or alternatively there is a bus stop almost at the door. We are situated at the gateway to the peninsula, a great spot for watching, or partaking in, windsurfing, kitesurfing, sailing, kayaking, fishing, or swimming. Further down the peninsula, a half hour drive, is the famous Royal Albatross Colony, where sea lions and penguins can be spotted also. There is also the beautiful Glenfalloch Gardens just 10 minutes drive down the peninsula. Smoking allowed outside only. Access is up a steep path, or down a path currently without a hand rail, so may not be suitable for people with mobility issues, please ask if concerned. Also may not be suitable for children under the age of 6, due to the deck, again please ask. No parties. Please air the place if cooking smells linger. If anything extra required, we will do our best to help. Close proximity to beautiful St Clair, and cafes, and only a 7 minute drive to the City centre. High quality accommodation with amazing views. Warm and cosy with everything you could possibly need for a wonderful holiday. We didn’t want to leave. We will be back to stay again. Glad everything you needed was available, I think even some sunshine! Thank you for your lovely comment on the quality of our accommodation, we try and maintain it to a high standard. Please do come again! This home was perfect for our trip. 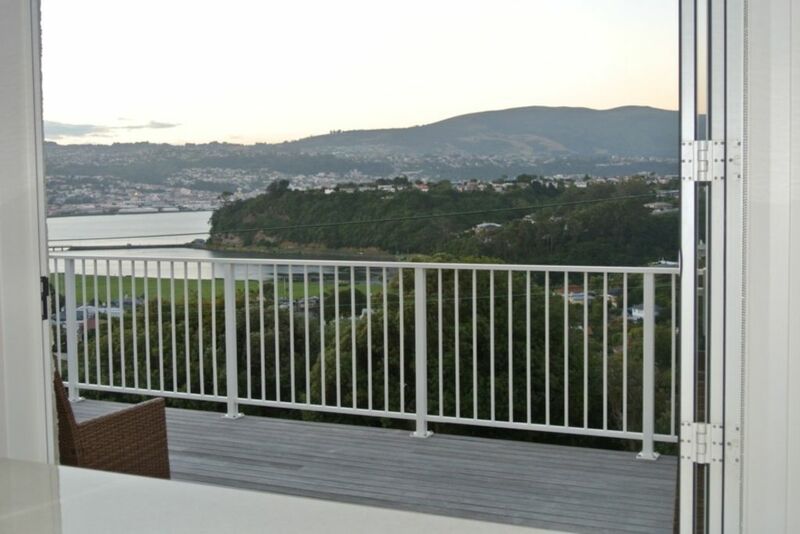 It was in a great location and had a great view of Dunedin. I will definitely stay here again when i come back to New Zealand. Thanks again for letting us use your house! Very pristine property. Amazing views and a welcoming home. Comfy beds etc. Will definitely try to use this again when in Dunedin. Thanks so much for your lovely feedback. It’s so good to hear the beds are comfy too. Please do come back when in Dunedin, happily have you return. We were really impressed with this home. The decor, the view, the quality of everything was amazing! The welcome of cheese plate was such a welcome surprise! We wish were we able to stay longer. Full marks and all the best for the future! Thank you so much for your glowing review, so happy everything was just right for you. I do attempt to keep it as I would like it if it were me staying, so extremely pleasing to hear such nice feedback. Thanks again. Don't be put off as you pull up to this house. The inside will blow you away! Spick and span throughout with great appliances and comfy beds AND a washer and dryer. We enjoyed a little welcome gift of grapes and cheese which was much appreciated. The home is a great stepping off point for exploring the Otago Peninsula as you can access it without driving through downtown Dunedin. There is a great new restaurant just down the the road called Bistro at the Terminus which served us one of our best meals of the trip. But the best was the fantastic view! Day or night it was such a treat to look out the many windows at stellar views of the city, the bay and the mountains. Very memorable.